While excavating above the old adit, pressurized water began leaking above the mine tunnel, spilling about three million gallons of water stored behind the collapsed material into Cement Creek, a tributary of the Animas River. 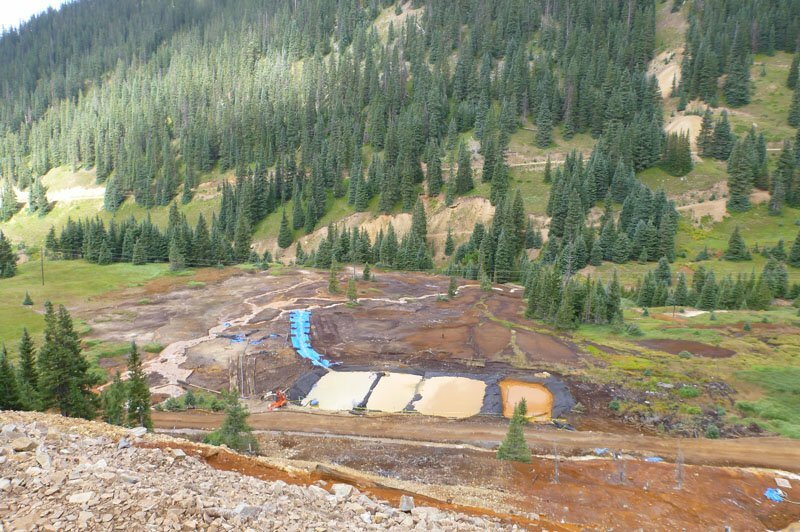 EPA takes responsibility for the Gold King Mine release and is committed to continue working hand-in-hand with the impacted local governments, states and tribes. These treatment ponds were built at mines close to the Gold King Mine in Colorado. When water leaves the mines, these ponds slow it down and allow us to adjust the pH and let contaminants settle to the bottom. As part of our Gold King Mine response, we’ve built diversion channels to direct water flowing out of nearby mines into settlement ponds where we treat it before it enters the creek. As part of our ongoing response, workers are almost finished stabilizing the road to ensure crews and equipment can access the Gold King Mine. A kayaker paddles the Animas River minutes after the La Plata County Sheriff lifted the ban on recreational river use on August 14, 2015. (Credit: Eric Vance/EPA) The Animas River in Durango, CO on August 14, 2015. (Credit: Eric Vance/EPA) The Animas River in Durango, CO on August 14, 2015. (Credit: Eric Vance/EPA) Water monitoring taken in the Animas River near Durango, CO on August 14, 2015. (Credit: Eric Vance/EPA) The Gold King Mine entrance area is shown on August 14, 2015. (Credit: Eric Vance/EPA) As water exits the mine, it flows into a system of four treatment ponds. The treatment ponds provide retention time to allow the pH to adjust. Here, lime is added to a settling pond to assist in the pH adjustment of the water prior to discharge to Cement Creek on Aug 14, 2015. (Credit: Eric Vance/EPA) Settling ponds used to precipitate iron oxide and other suspended materials from nearby Red and Bonita mines drainage are shown in this Aug. 14 photo. (Credit: Eric Vance/EPA) Area Command photo: Area Command staff from EPA and Coast Guard receive updates during a morning briefing. Sampling photo: EPA team monitor water in the Animas River to assure water quality is remaining at pre-event levels. EPA has added the Bonita Peak Mining District to the National Priorities List. The Gold King Mine is included as one of the potential sources contributing to the Bonita Peak Mining District site. View the Bonita Peak Mining District site. Before calling the hotline, please check these local resources. Aug. 4, 2017: EPA Administrator visits GKM and announces agency will reconsider FTCA claims. Mar. 16, 2017: EPA posts guidelines, FAQs on WIIN Act reimbursements. Feb. 17, 2017: Follow-Up Monitoring Data added. Jan. 13, 2017 Update: Determination reached on FTCA claims. Jan. 13, 2017 Update: Emergency Response report added.